Airline Twitter accounts are bombarded with an insane amount of angry customer service queries. The poor souls running these accounts are pretty much steel-nerved warriors, but one social media whiz at United Airlines proved to be the ultimate eyes in the sky for a Cleveland Indians fan who had trouble watching last night's playoff game against the New York Yankees. 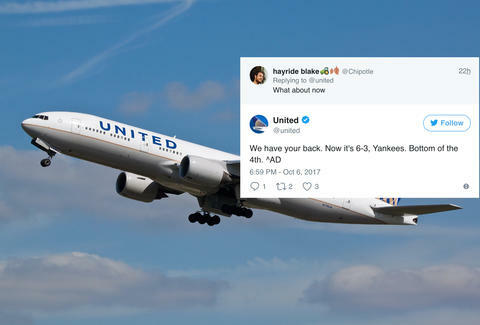 It started when the gentleman (who sports the gentlemanly handle @Chipotle) tweeted at United, notifying the carrier that his in-flight WiFi was hiccuping during the MLB playoffs. Flying high above its usual mandate, United's Twitter began providing some game updates. The riveting sports-ball dialogue continued throughout a couple innings. A few moments later, @Chipotle's wildest dreams came true, because the Indians rallied. United was more than happy to bare the good news. The Indians went on to mount a pretty improbable comeback, winning the game 9-8 in extra innings, while United did a pretty fine job making up for its spotty connectivity. Your move, literally every other airline in America.